This set is perfectly attuned to homebodies who appreciate a few more aesthetic touches to their already smart looking living room. The 2017 LG Electronics 50 inch Smart LED TV has this in mind and more. It is nicely attuned to natural settings where a lot more exterior light is preferred. Of course, at night when the real action is only starting, things look a lot different, and pleasingly so. 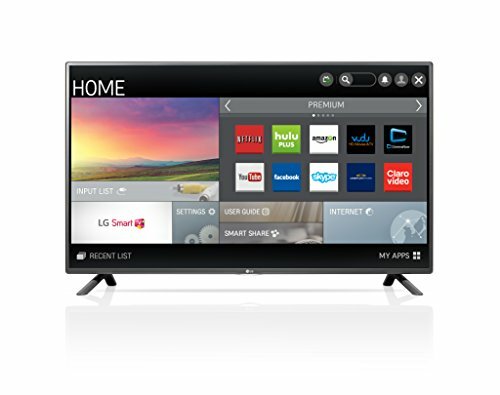 This LED TV does well in any room where there is a lot of lights. The 50-inch screen is coated to take into account exterior light. Also; setting the picture right to adapt to surroundings does wonder for the judging eye. A big plus here is that viewers will not encounter any glaring problems while watching daytime shows or live news coverage. Where picture quality is concerned, this LG is a natural all-rounder. Long before customers are even thinking of customizing settings, the picture is already pre-calibrated to be compatible with major TV networks. This is significant for sports lovers who don’t want to miss all the finer details of their live broadcast. It has also been prepared well for Blu-Ray movie watchers. Pretty much all manufacturers of high-end entertainment centers have had to work hard on the challenge of getting their product’s sound quality to match the crispness of their LED screens. Some users appreciate this and are amenable to taking this to the next level by initiating full use of the set’s fully-compatible ports. So, if users truly need to optimize their sound quality, they can do this. But, truth be told, it should not be necessary with the LG Electronics 50LF6100. TV speakers have, as their picture counterpart, been pre-prepared. Sadly, the IR Receiver is merely adequate. LG manufacturers will have taken note of this already, so expect their sequel to this current 2017 product to be an improvement. Because the focus is on visual presentations of movies and TV impressions, the installed smart functions are standard additions, if not basic. But for users focused solely on the overall variety of this LG package, this is more than adequate. A plus factor here is that users won’t encounter any lags. Again, they can take advantage of the available ports to make their own modifications without interrupting the electronic settings. The emphasis falls back to aesthetics. It seems as though designers were intent on creating a sleek module that occupies a discrete space in the chosen room when not being used. Ultimately it is a good home entertainment center that should be seen and heard.